My current county introduced the idea of giving high school students choice in what they read. For most of us, this idea seemed quite foreign; however, the Professional Learning Community (PLC) that I am part of decided to give this a try. We worked and worked and created some things, and last school year we gave this idea a try with much success. This year, I have working to tweak what we did last year by doing some reading on choice novels. While researching, I stumbled upon this intriguing blog. The author of that blog, Pernille Ripp, is arguing the point that students should be given more choice in what they read. The blog was thought-provoking, but the comments about the blog were just as intriguing. People were totally agreeing with Ripp and others were on the opposite side of the fence. And, I must say that I am somewhere in the middle; I value whole class novels and choice novels equally, and right now, I incorporate both into my classroom. 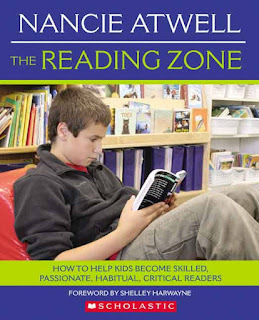 Several of the people who commented on the blog were highly recommending the book, The Reading Zone by Nancie Atwell, and I felt that I must give it a try. This book, The Reading Zone is a must read! Yep, I absolutely love this book. Before I tell my thoughts about this book, let me tell you about a conversation that I had with someone whom I respect in education. He stated "We've been doing this for years." He was referring to the idea of allowing students choice. So, if you have been giving students choice for years, please share your ideas in the comment section. But, for me, the idea of choice in high school is still very, very new. Nancie proposes that we turn students into readers by allowing them to read whatever they want to, and she gives suggestions on meaningful activities that can accompany the reading. She goes on to say that tons of high schools are doing the opposite; we are turning students off when it comes to reading. She notes that what we call rigor which often includes tons of note taking, essays in MLA format, and lots of questions to answer, turn students completely off. Nancie proposes that teachers build in time to read in the classroom, that we have book talks about the books that students are reading, that we give students choice, and basically remember why most of us wanted to be English teachers in first place. And for most of us, that was to get students to love literature as much as we do. After reading this book, I went to the other teacher who teaches Advanced Placement and proposed that we change our summer reading assignment from asking students to read one book that we selected, to giving students a list of books that we absolutely love and giving them the choice to read books from our list or selecting other books, as long as they read during the summer. Now, we will have no way of knowing if students read at all over the summer, but we also do not know if they ever really read the book that we assign. My fellow elementary, middle and high school educators, please consider reading The Reading Zone!